Dark Sector is a first person shooter that lands you in the role of `Hayden Tenno’ a secret, yet elite, agent operative sent out into the Eastern Bloc in the wake of the Cold War. Unfortunately this mission seems to have been a one way trip as a dark secret has been swept under the old Cold War rug. You are attacked by a mysterious enemy having neutralised a diseased member of previously deployed unit. However, death does not come and you awaken alone and altered. Whatever the mysterious assailant has infected you with, it has mutated to give you inhuman skills and abilities. Throughout the game these powers get stronger and Tenno must learn to assimilate them, not only to survive, but to avenge his abandoning. You start with a brief yet good looking cut scene and move into a prologue that lets you get to grips with the controls. The learning curve is just about right, with the basics given in prompts and other features (such as picking up ammo and reloading) left to you to work out for yourself. Learning by doing as they say. The controls, specifically the camera and first person, over-the-shoulder view initially seem overly sensitive but you will quickly get to grips with this and once you have done, the controls seem pretty tight and smooth. A plus, in my eyes at least, is that the initial cut scene doesn’t explain every single aspect of what is going on. Quite the opposite, you are not treated like a recently lobotomised squirrel instead you are left to figure out what is going on and therefore the plot is left to develop like any decent feature film, giving you more of a chance of being hooked. Once infected you are left to fend off many a mutated creature and random Russian soldiers. (Pesky Russians, its always them.) 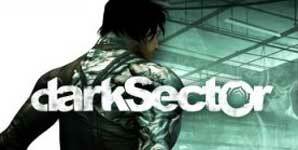 Dark Sector is brilliantly gory and thoroughly deserving of its 18+ rating. The main reason for this resolves around the source of your attack. Once infected, your primary weapon is the `Glaive’, a three pronged boomerang type blade which is razor sharp. The camera zooms in on the Glaive as soon as it is thrown which allows you to control the direction of its attack as it lops of heads, limbs, extremities and anything else it finds in its path. What follows is bloody, very bloody. However, its not all good. The Glaive is controlled by the PS3 pad motion sensor, which is inaccurate at best. This can be quite frustrating at best and completely anger inducing annoying at worst. Worst still, I persevered with this before realising after a good couple of hours in that you could change this control to the d-pad. That pretty much hacked me off too. You might say that is my own fault for not paying attention to detail. don’t. Whilst you have a vast area of weaponry to choose from, I can’t see any reason to use them once in possession of the Glaive. This weaponry can only be carried in small numbers, say two guns and a handful of grenades, which may be realistic but certainly isn’t fun. The graphics and sound are good and definitely what we have come to expect from the PS3 as a rule. The title looks well and the sounds & score add to the suspense of the game, but nothing here is ground breaking or new. You can apply this to the game-play as well. This is, in general, a run of the mill first person suspense shooter, with a cool boomerang knife weapon thrown in to mix things up a little within a standard plot structure that features inhuman creatures and those damn pesky Russians.